Something tells me Kwedit, which launches today, is going to be a hit. It’s a new payment service that absolutely doesn’t guarantee payments. In fact, its unreliability is what makes it so attractive to social game publishers and other people selling virtual goods. It’s also a great way to let the unbanked masses out there pay for stuff without getting sucked in to scamville-type scams. The product is called Kwedit Promise. Here’s how Kwedit works: they let users take on fake debt instead of paying for virtual goods with real money (or via scammy or legitimate offers). A user promises to pay later. It’s not an enforceable promise, and there is really no consequence if a user doesn’t pay. But there are built in incentives to pay it off, and Kwedit expects some percentage of people to actually do so. As users take and pay off, or default, on Kwedit promises, a virtual Kwedit score moves up and down just like a real-life credit score. Users get more credit (err, Kwedit) when they actually pay the stuff they agreed to. And if they don’t pay, the kwedit score goes down and getting more Kwedit becomes difficult. There’s some risk that users will try to sign up under another name to start fresh – but since most of the virtual games are on social networks and tied to established identities, that won’t work very well. Kwedit also makes it very easy to pay off promised amounts. Most users won’t have credit cards, so they can’t pay via normal online methods. But users can print out (or save on their phone) a bar code and take it to any 7-11 store in the U.S. for payment. Or they can mail in cash via a pre-printed postage paid envelope (called the Kwedit mailer). 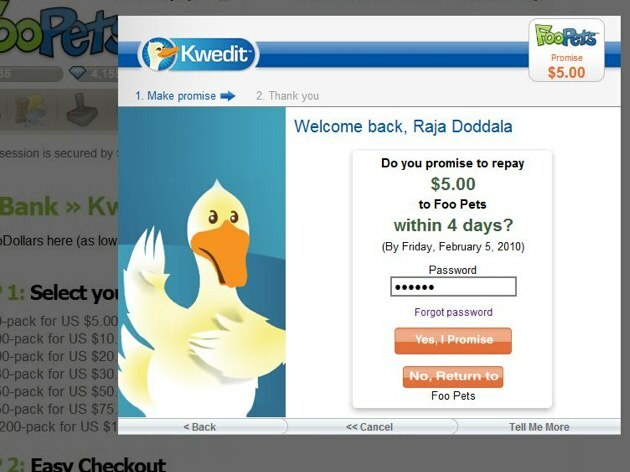 And there’s a third way as well – users can ask others to pay the Kwedit for them via “pass the duck.” It’s a social payment feature that sends a message to a friend or family member asking them to pay. What do I think of this? I think it’s brilliant. Social gaming companies like Zynga have said that they can only monetize a few percentage points of users via direct payments. They try to increase that number via offers, which is a slippery slope towards Scamville. Kwedit falls in between direct payments and offers. And even if users default, the Zyngas of the world aren’t out any cash. They’re just giving away virtual stuff in exchange for the Kwedit, after all. I have some concern about cannibalism, where a user chooses Kwedit instead of paying directly even though they have a credit card. The company says that will certainly be an issue, but they think that on balance they’ll be a net-positive payment option. If Kwedit’s early days are successful, look for all the gaming companies to jump on board quickly. And I also think this is a great idea for other virtual goods services – like online music. 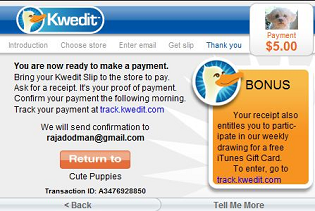 I’d love to pay for music on iTunes or MySpace music via Kwedit. At some point, we may just be able to. At launch Kwedit is available on 100 social games, and also as an option on Social Gold. Is Kwedit unreliable? Yep. Is it Brilliant? Absolutely.